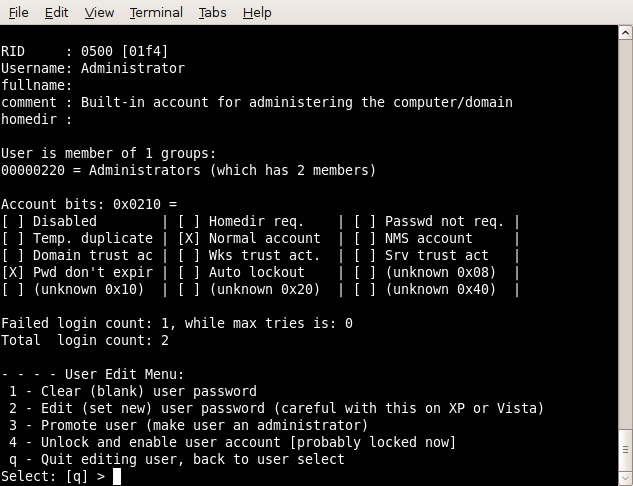 Most Ubuntu users also have Windows installed on their computer.In such cases you can Reset or Change the passwords of Windows User Accounts from Ubuntu/Ubuntu Live CD using the chntpw tool. You need to enable Read/Write Access to NTFS partition on which Windows is installed, to use the chntpw tool. Tick the NTFS partition where Windows is installed and give a suitable mount point like xp. If you find this confusing,then tick all of them and assign the mount points as xp,xp1 etc. In the next window Tick Enable Write Support for Internal Device. You can see your windows partitions mounted here as xp,xp1. Open each one of them and look for the Windows folder.If the Windows folder is in xp then your Windows is installed in that partition. 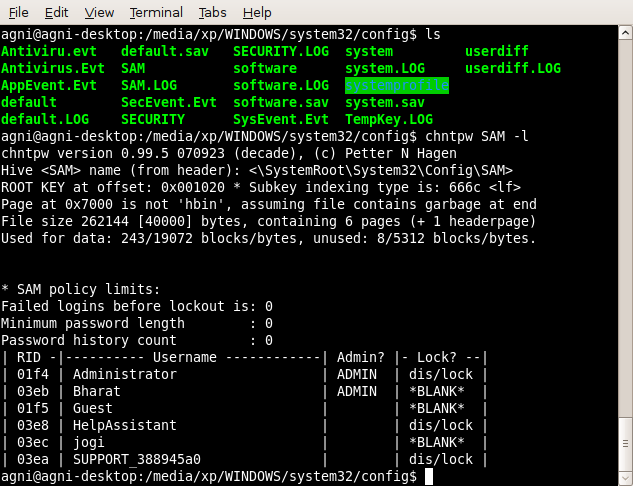 The windows passwords are stored in the SAM file located Windows/System32/config. Since the path is case sensitive you may get an error saying No such file or directory.Open the above path in the Nautilus File Manager and make a note of the Uppercase and Lowercase characters.Sometime the Windows folder might be named as windows with a lowercase w or as Windows with an uppercase W.
It display the list of files in the Config folder.Make sure a file called SAM is present. To display the list of users execute the following command at terminal. To change the password of the Administrator account execute the following command at terminal. And follow instructions on the screen to reset or change and press the appropriate key.Example press 1 to reset the password. Thats it.Now restart and boot into Windows and log into the Administrator Account without any problems. Thank you for this article. I was able to use it and it worked great! I had a laptop from work that had no optical drive so my Konboot was useless and this was exactly what I needed. I hope to find many more articles like this!! I am glad that my article was helpful to you. Thanks, I’m gonna try this. BTW, if you apt-get these on a persistent Linux flash drive, you can use it as a portable pass-changer that makes you look more pro than OphCrack. Thanks kyothine, for that info on persistent Linux flash drive. I have personally tested a windows password recovery tool which is named “windows login recovery”. Burn a boot CD with the program, and insert it into the problem computer and your password will be reset to “Blank”, without losing any data and you needn’t reinstall windows OS. This tool is not free.You have to pay for it. HI! You post is quite inspired. but I didn’t know the way your post mentioned. It is great to know it now! this turorial is great! tthe only problem is that I don’t want to DELETE or CHANGE the password I just need to know what it is. Windows does not store the password itself anywhere so it is not a simple task to just read the password out of a file. Almost all cryptological password systems use hashing functions, which take a string (in this case a password) and convert it into a huge number, this number is called the hash of the password. what the password that generated that hash was. This means you need to guess passwords untill it gives you the right hash. that you still cannot simply read the password out of a computer. a keylogger is your best bet. i am a new ubuntu user and really want to get this to work because i forgot my password to windows and reformatting is not an option. any help is appreciated! I am sorry.I did not understand your question.Can u please elaborate? I am new to this but if I did promote a user to administrator level.. rebooted – logged in as user – logged off and then modified SAM again to the original administrator account.. that should work too right? I’ve read in other posts that ‘chntpw’ messes up a lot.. what do they mean by this? i was looking for this tutorial, thanks a lot! I have tried a tool which can recover any Windows password and have success.